The wheels on the ExploraDome were noisy and rough, causing the azimuth motor to work harder than it should. A member of the ExploraDome Yahoo group came up with a replacement wheel solution that I decided to implement. 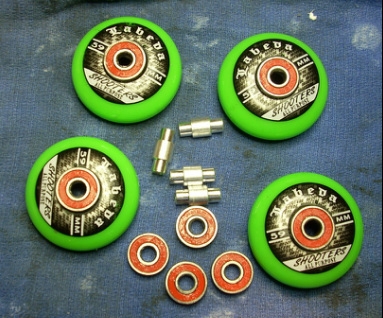 Shown are the new 59mm urethane wheels and 608 sealed ABEC 5 bearings. I purchased bearings from eBay and wheels and bearing spacers from InlineWarehouse.com (bearings are also available through Inline Warehouse). 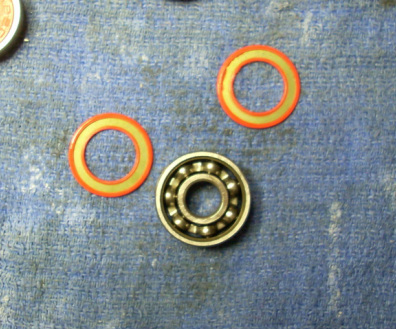 One of the 608 bearings with the seals removed. 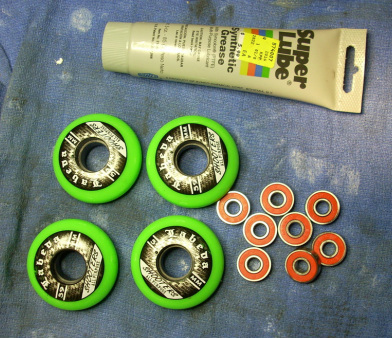 The bearings were oiled as received and felt smooth, but I decided to pack them with Super Lube synthetic grease to ensure I will never need to re-lubricate the bearings. This is probably overkill but I wanted to ensure I wouldn't be pulling the wheels again. A bearing packed with Super Lube. 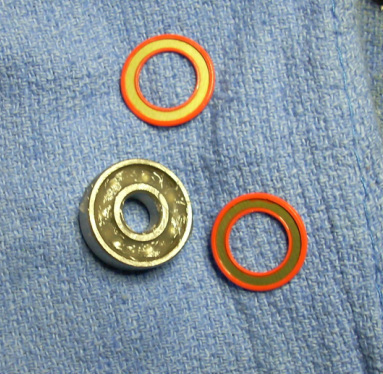 The packed bearing doesn't spin as freely as the oiled bearing but that's really been no problem in this application. This is a low RPM usage and I am more interested in not having to try to relube hard-to-get-to bearings. 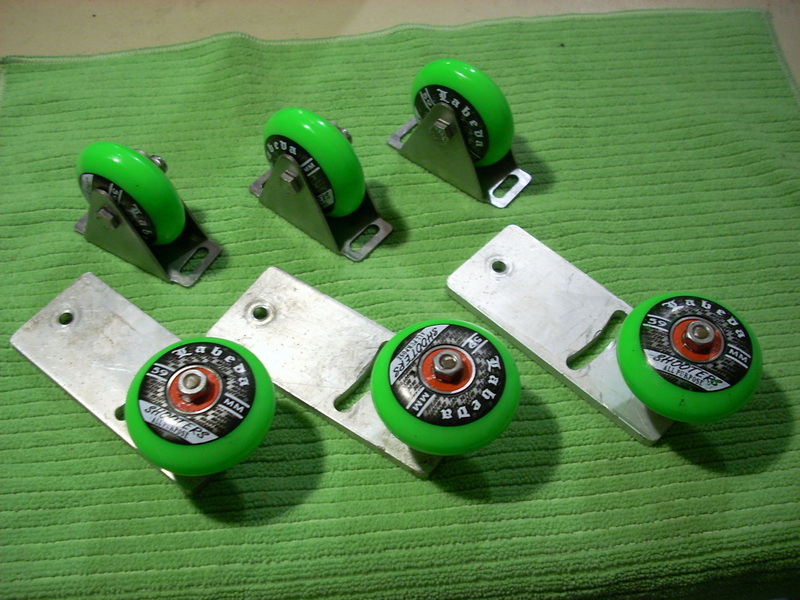 Assembling the wheels and bearings. 6mm bearing spacers are inserted into the bearing set during assembly. The bearing spacers also came from InlineWarehouse.com. 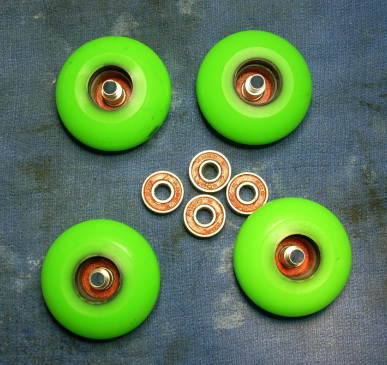 The bearing spacers inserted into the wheels before the top bearing is inserted. To install the bearings, I placed a bearing into the wheel opening by hand, flipped the wheel over and pressed the wheel against the workbench to seat the bearing. 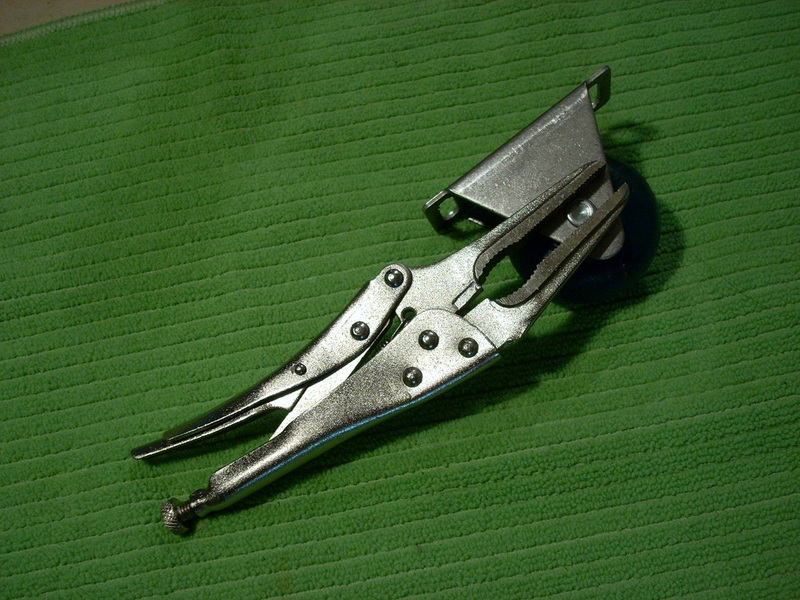 An original lateral roller and mounting plate. 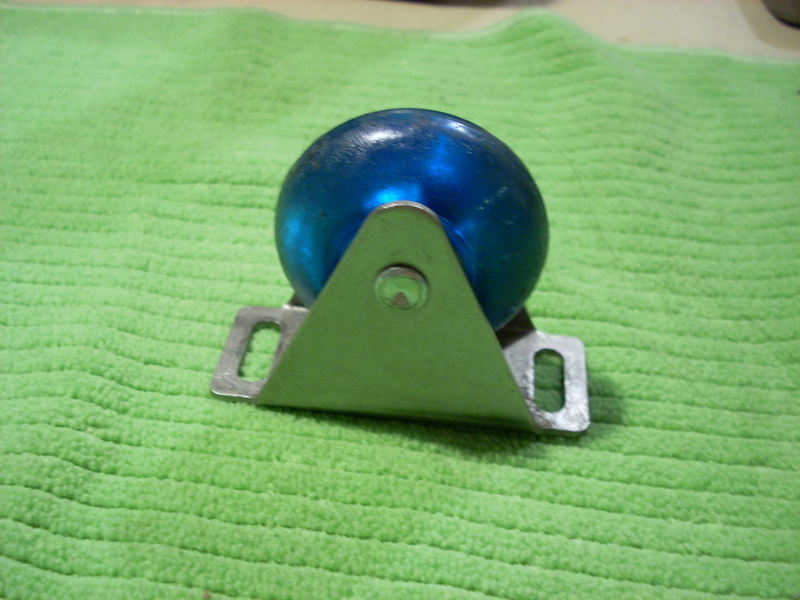 An original dome roller. These rollers are actually smaller than 59mm but the 59mm wheel fits into the bracket with no problems. The larger wheel does raise the dome a few millimeters higher, but I had no real issues with that. The only consequence I found was having to adjust my azimuth drive gear a little higher. 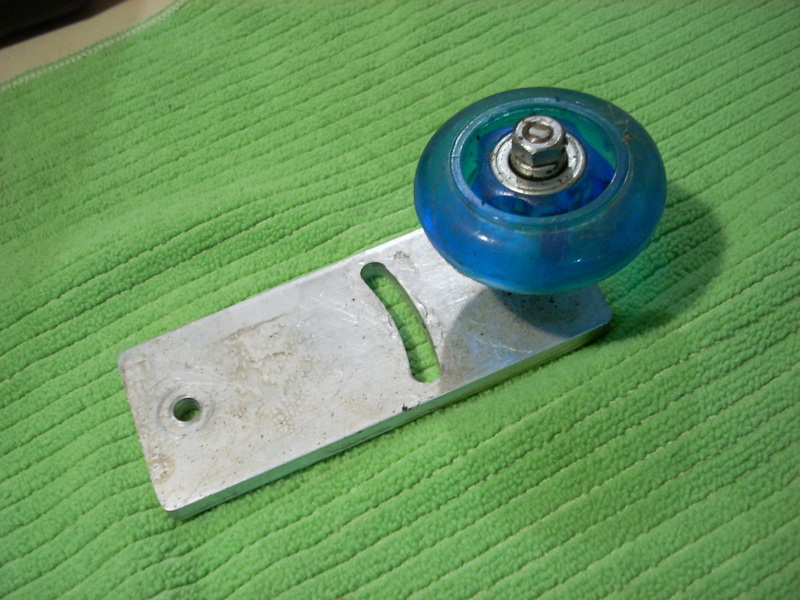 The dome roller wheel has a riveted axle that has to be drilled out to replace the roller. To drill off one end I had to clamp the opposite end of the axle with locking pliers to keep it from spinning with the drill bit. After drilling the axle and removing the old wheel the new wheel is ready to be installed. 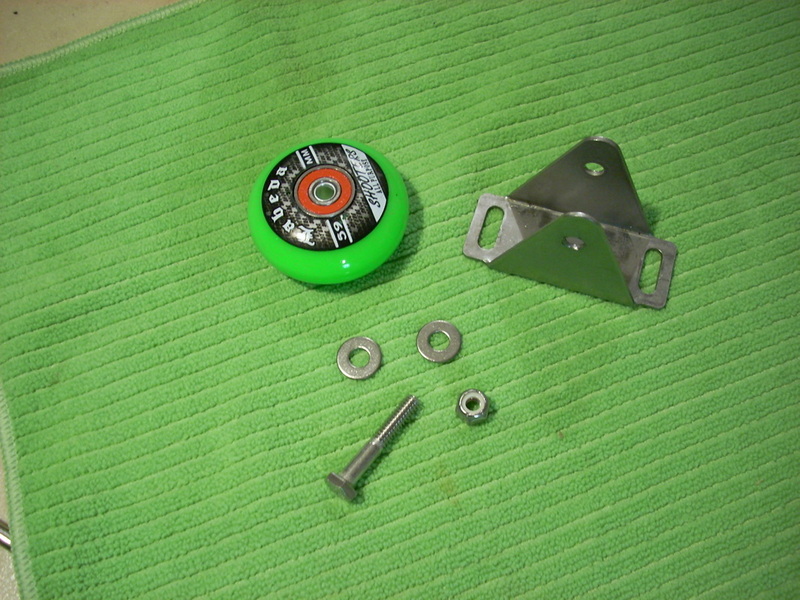 Shown are the parts needed to attach the new wheel to the bracket. 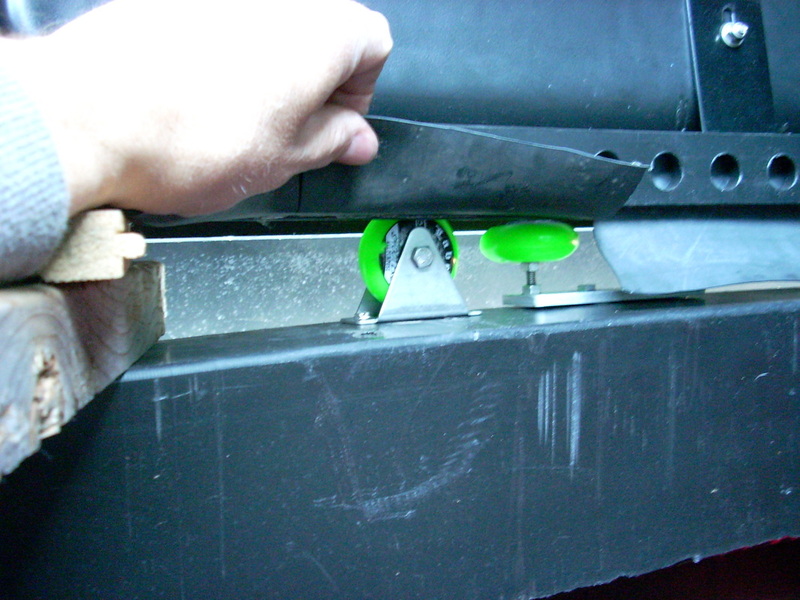 The washers go on either side of the new wheel and act as spacers to prevent squeezing the bracket against the wheel when tightening the self-locking nut. Some of the rebuilt wheels ready to be reinstalled. The lateral rollers were already mounted using stainless steel 1/4" bolts, so no new hardware was needed here - simply a matter of swapping the old wheels for new ones. A set of wheels reinstalled in the dome (I have the dome raised on wood blocks to get a better view). The last step in the upgrade was to readjust the wheel positions. Wow! is all I can say for the difference in dome rotation. Smooth, quiet and I can spin the dome with a couple of fingers. Also notice the piece of rubber sheeting I'm holding up to view the wheel. I installed a ring of rubber sheeting to keep dust and air from blowing in through the gap between the dome and dome mounting ring. I then cut slits in the sheeting about every 6 inches to allow it to lay better against the dome ring. The rubber was left over from the pond liner for our Koi pond. I attached it to the wheel channel with double-sided carpet tape and then installed the the azmuth gear track over top to sandwich it in place. The tape alone was not enough to hold the rubber in place on a hot summer's day. It does a very good job of keeping dust out of the obs.